CZ2128 is a member of the "Pleiades Six Stars," the battle maid squad of the Great Tomb of Nazarick. She is a short girl with red-gold straight long hair. 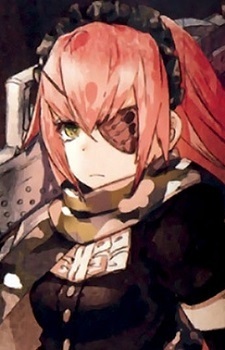 She wears an eyepatch over her left eye, while her right eye has an emerald color and target-mark on the pupil. She wears accessories with military camouflage patterns. While her face is beautiful, she does not show her emotions and talks in a flat tone. CZ2128 appears emotionless and has a silent nature. Her Karma is relatively high, which makes her, along with Yuri Alpha, one of the two "safe" Pleiades to humans. Though she usually ignores conversations from humans, sometimes there is a possibility to communicate with her. She hates cannibalism and likes cute things, such as Eclair. CZ2128's creator was one of the Supreme Beings, other than Tabula Smaragdina, responsible for the design of Treasury security systems. Thus her character settings are set to be familiar with Nazarick's mechanism unlocking methods. In the web novel version, she was created by Tabula Smaragdina.